Jesus prayed for unity among his followers, yet when outsiders look at the church they often see infighting and division. Are there differences that are worth dividing over? This book goes to the Bible for answers, finding examples of how Christians should deal with their differences. 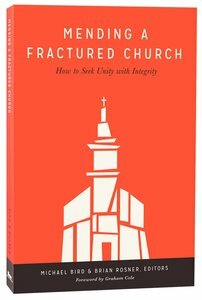 About "Mending a Fractured Church"
Jesus prayed for unity among his followers. He wants our unity to demonstrate the truth of his claims to an unbelieving world. Yet what does the world see when they look at the church?So often, they see a church divided. Our infightings range from petty matters of opinion to legitimate theological concerns. But to the world, it's all another reason not to believe.What does it really mean for the church to have unity? How should we deal with diversity? Which differences are worth dividing over?In Mending a Fractured Church, editors Michael Bird and Brian Rosner seek to answer such questions, looking to the Bible for examples of how to behave when Christians differ. Speaking to pastors, churches, and seminary students, they provide a guide to maintaining unity without compromise.